Last week I spent three awesome days at the Presentation Summit. In this post, I want to explore what audience members remember from a presentation, using the first three keynotes of the conference as my examples. I asked as many people as I could what they remembered from each of these keynotes. This was an informal, non-random, non-scientific survey. Nigel Holmes is a phenomenal graphic artist who used to be Art Director for Time magazine. His presentation didn’t start well – there were a few technical hitches and it took him some time to hit his stride, and even then he wasn’t a hugely energetic speaker. When I asked people about Nigel’s presentation, they often mentioned the slow start, but then they went onto say that they loved what he showed us, and enjoyed his quirky brilliant mind. Every person I talked to had a different take on what was the point of Nigel’s presentation, depending on what had most relevance to them. 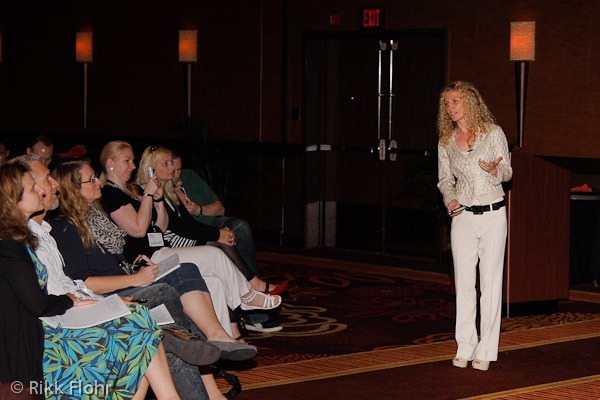 Words such as sparkling and scintillating were created to describe speakers like Carmen. Everybody I spoke to loved her as a speaker. One person said “I don’t care what she talks about, I’ll listen to her”. They often mentioned what she was wearing – a gorgeous cream and gold jacket over cream trousers. Then they mentioned her slides – how polished and beautiful they were. I had to prompt people as to what they remembered from her presentation. As with Nigel’s speech, everybody gave me a slightly different answer. Garr presented to us via Skype. Audience members were immediately able to say to me that Garr’s message was “Be like bamboo”. And they knew what the metaphor meant – be flexible and adaptable like bamboo. Garr made 10 points elaborating on this bamboo metaphor. When I prompted people to recall those 10 points, most people could recall only one or two. Garr’s bamboo metaphor also elicited some strong reactions. I was talking to two women and one said to me “We’re adding a room to our house and the floor is bamboo. I felt so pleased that we’d chosen bamboo – it’s strong but flexible.” Then the other woman erupted: ‘I hate bamboo. Our neighbor has a forest of bamboo and it keeps sprouting up on our lawn. We just can’t get rid of it. I hate bamboo!” Neither of these two women could remember any of Garr’s points. 1. You don’t have a second chance to make a good first impression, but the cleverness of that saying has eclipsed the broader truth – that you have many chances to correct that first impression. Your presentation is not ruined if you make a bad start. 2. Your message, your slides and your delivery need to be balanced. You don’t want your presentation to be like a movie where people only remember the awesome special effects. Your slides and delivery are there to serve the message. 3.If you don’t present a clear overarching message, your audience will choose (sometimes randomly and unconsciously) the message they take out from the presentation or they may not get any message at all. 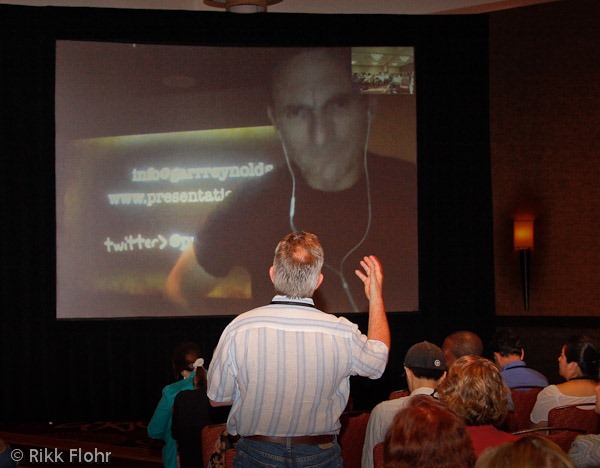 For most types of presentations, I believe it should be you, the speaker, who decides what the overarching message is. I’ve said “most types of presentation” because I can see that it could be a valid approach to give a speech from which each person takes a different message – depending on what is most important to them. 4. When you choose a metaphor as your overarching theme, beware of the baggage your metaphor may carry. It might be necessary to acknowledge possible preconceptions at the beginning of your presentation so that your audience can put their reactions to one side and focus on your message. 5. If you cover many points of equal importance and at the same hierarchical level, your audience will have difficulty remembering them all. 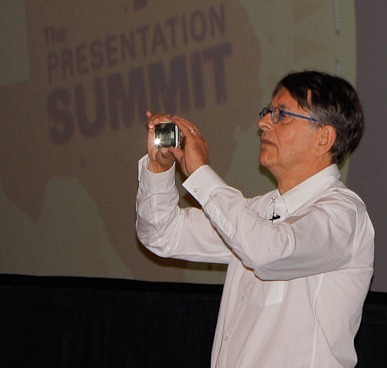 I loved my time at the Presentation Summit. To be able to hang out for 3 days with people as interested (obsessed?) with all things presenting was awesome. The dates for next year’s conference are October 17th- 20th. Great tips. I’ll add one that I always incorporate into my own work. Throughout the presentation, pause and ask the audience something like, “So, what is sticking with you so far about the work we’ve done together?” This allows me to see what is actually transferring to them, reinforces key points, and, most importantly, lets them hear the dulcet tones of their own voices, thereby solidifying key points even more. I’ve never been disappointed by using this technique. Lesson: Share the stage with your audience. No matter how fascinating you may be, they will always find themselves to be more fascinating. Count on it, and use it! Thanks Ken, that’s a great tip. Great tip, Ken, thank you! @Nikolas – Thanks. It took me 25 years of presentations (and years of therapy) to get that fact. This is a fabulous idea for a post! Thank you for getting down in the trenches and asking feedback from the troops. On the flip side, I saw a presentation once where the person hammered ONE POINT home for an hour and a half. That was even more frustrating. I guess the trick is to find a good balance between not enough and too much. I know I cram way too much info into my presentations, so this post is a great reminder for me to edit, edit, edit. No matter how valuable your info is, it does no good if the audience can’t remember it! Anything can be taken to an extreme! I agree that if the speaker spends all the time on one point – that would get deadly boring. However, most of us do tend to err on the side of cramming too much. Excellent point and one I have been thinking about too. Recall of the material covered is indeed only one possible goal for a presentation – and for some presentations it may not be important at all eg: if you’re seeking to persuade a committee to make a particular decision, the only objective is that they adopt that decision – there is no need for them to remember the arguments you used to get them to that decision. I’ll explore this idea more in a future post. I think every person in the audience is trying to connect a speaker’s message to their own reality. 100 people watch a movie. The guy who fancies a girl will remember every moment that answered his questions about how to approach her. The girl that is thinking of leaving her boyfriend will remember every point that reflects on that decision. The football crazed teenager will remember the football scenes. Conor – it’s a great distinction that you’ve made. I think it depends on the topic and the audience. But I think presentation coaches/authors tend to overemphasise the speaker’s role of making the material relevant. As you point out the audience are generally quite good at doing that for themselves. Interesting that no one mentioned the last thing the speaker said – their Closing. The Law of Primacy and Recency says we’ll remember the first and last things we hear and see more clearly than points in the Body of the Presentation. 1. From my memory of the presentations, there were no strong closings. 2. My survey was very informal and unscientific! I wonder if it’s possible to curtail some of the problems with memory by grouping the most important points of information into “chunks” so that they remember a series of beginnings and endings? I think chunking information is a great idea for helping people to remember. Good stuff to remember, Olivia. Love this post! This informal survey and your take-aways was really insightful, and very helpful! The possibility that a metaphor might actually bring up emotional responses that interfere with hearing the message is important to know, and I don’t think I’ve ever heard that before! It was also fascinating that one speaker’s personality and looks were enjoyed, but her message seemed to get lost. Amazing to think of them sitting there drinking in her sparkle while not really paying attention to what she was saying, or at least not enough to remember some kernal to take and use in their lives. Great article, Olivia! Always a pleasure to read you. I find it very amusing how the audience readily remembered the lady presenter’s attire but easily forget her message! She literally stole the show away from her presentation! Anyway, every audience brings along it’s own headache. It’s up to the speaker to supply enough paracetamol to get his message through the resistance. However, one thing I’ve come to realise is that audiences are easy to please. Sometimes we spend too much energy thinking about the audience IN THE WRONG WAY. Focus more of that energy into crafting a simple presentation with a clear message that’s RELEVANT TO THEM and you will nail it. Excellent post. Lessons identified or key take aways make all of us better presenters especially when they are turned into lesson learned. One thing I have noticed is that an audience can be easily distracted by slides that have not been edited. Edit and have a peer review your slides and/or handouts. I am a sophomore college student and reading your tips definitely helps! I know your blogs will aid a variety of people who will need help in presenting. I learned that dressing for the presentation is essential because it makes you look professional and ready to talk. “You don’t want your presentation to be like a movie where people only remember the awesome special effects. Your slides and delivery are there to serve the message.” That is definitely a helpful one too and I know that my vocal tone will affect my presentation too. Did those keynotes say uh and um alot during their presentation? In my class, we are learning to avoid that! I have never noticed I said it so much. I pay a lot of attention to it now that I even realized that Obama says it too! Always nice to read your articles Olivia. I’ve just got home from a tech presentation where I’ve spoken about some of the newest Android gadgets and you are right. If you don’t present a clear overarching message, your audience will choose the message they take out from the presentation. It’s always better to speak frankly and without many hassles about the subject, may it be from different directions but the words should be related to the topic of the presentation. I agree with that with point #5. If you don’t guide your audience, and communicate to them which of your points is most important, they just won’t know. Thanks for sharing – great article!